He reinvented the symphony, reshaped string quartets, and redefined piano sonatas - but there's much more to learn about Ludwig van Beethoven, the deaf composer who changed music forever. 1. When is Beethoven's birthday? Ludwig van Beethoven was born in Bonn, Germany in December 1770… but no one is sure of the exact date! He was baptised on 17 December, so he was probably born the day before. 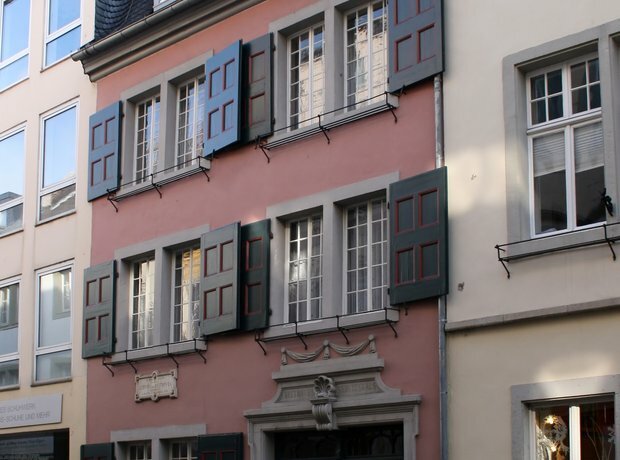 His birthplace (pictured) is now the Beethoven-Haus museum. Never mind the exact date, the year of Beethoven’s birth is sometimes questioned, and for years the composer thought he was born in 1772, two years too late. This may have been a deliberate deception on the part of his father (pictured) to make the musical prodigy seem younger – and therefore, more advanced for his age – than he actually was. There’s some speculation about when the young composer started setting his ideas on paper, but the only piece to date from as early as 1782 is a set of nine variations for piano. Beethoven set himself apart as a musical maverick even at the age of 12 – the music is in C minor, which is unusual for music of the time, and it’s fiendishly difficult to play! Finding a wig maker? Noting the address of a dance teacher? Oh, and finding a piano, of course. Beethoven kept a diary of his day-to-day activities when he moved to Vienna in 1792, giving us insights into his personality. By 1793, aged just 22, Beethoven often played the piano in the salons of the Viennese nobility. He often performed the preludes and fugues from Bach’s Well Tempered Clavier and quickly established himself as a piano virtuoso. Composing anything at all is a challenge, even for a musical genius. So when you consider Beethoven started to go deaf around 1796, aged just 25, it’s a wonder he managed to write any music at all. He communicated using conversation books, asking his friends to write down what they wanted to say so he could respond. 10. Beethoven's Symphony No. 1 – a musical joke? Beethoven was 30 when his first symphony was first performed in the Burgtheater in Vienna (pictured), and it went where no symphony had ever gone before. Symphonies were seen to be pretty light-hearted works, but Beethoven took this one step further with the introduction, which sounds so musically off-beam it’s often considered to be a joke! Despite his increasing deafness, by 1802 Beethoven was almost at breaking point. On a retreat to Heiligenstadt, just outside Vienna, he wrote: “I would have ended my life – it was only my art that held me back. Ah, it seemed to me impossible to leave the world until I had brought forth all that I felt was within me.” It’s known as the ‘Heiligenstadt Testament’, and was published in 1828. It's hard to split Beethoven’s music up into sections, but it’s generally agreed there are three different periods with three broad styles. The first is his early period, ending around 1802 after the Heiligenstadt Testament, and includes the first and second symphonies, a set of six string quartets, piano concerto no. 1 and 2, and around a dozen piano sonatas – including the 'Pathétique' sonata. After his personal crisis, it’s perhaps no surprise that Beethoven’s middle period works are more emotional. A lot of the music from this period expresses heroes and struggles – including Symphony No. 3, the last three piano concertos, five string quartets, Beethoven’s only opera, Fidelio, and piano sonatas including the ‘Moonlight’, ‘Waldstein’ and ‘Appassionata’. It’s one of Beethoven’s great piano works, but he never knew the piece as the ‘Moonlight’ Sonata. He simply called it Piano Sonata No. 14, and it wasn’t given its poetic nickname until 1832, five years after Beethoven’s death. German poet Ludwig Rellstab said the first movement sounded like moonlight shining upon Lake Lucerne, and the name stuck. Beethoven admired the ideals of the French Revolution, so he dedicated his third symphony to Napoleon Bonaparte… until Napoleon declared himself emperor. Beethoven then sprung into a rage, ripped the front page from his manuscript and scrubbed out Napoleon’s name. Some modern reproductions of the original title page have scrubbed out Napoleon’s name to create a hole for authenticity’s sake! If a job’s worth doing, it’s worth doing properly. He may have only composed one opera, but Beethoven poured blood, sweat, and tears into revising and improving it. He reworked the whole opera over a ten year period, giving us the two act version performed today – the older version is sometimes known as Leonore. Symphony No. 9 with its choral finale, the Missa Solemnis, late string quartets, and some of his greatest piano music including sonatas and the Diabelli variations – Beethoven’s late period is jam-packed with musical genius. Much of the music is characterised by its intellectual intensity, but it sounds just as wonderful to beginners and Beethoven-lovers alike. The moving music from Beethoven’s Symphony No. 7 is a perfect soundtrack to 2010 blockbuster smash, The King’s Speech, as George VI makes his address to the nation. You’ll also find hints of his fifth symphony in unexpected places, if you listen carefully – have you watched Saturday Night Fever recently…? Symphony No. 9 is often nicknamed the ‘choral’ symphony, but it’s only the finale that features a choir. Using singers in a symphony was a wild idea at the time, but it seems to have paid off – Beethoven’s Ninth Symphony changed the face of classical music forever, and continues to inspire listeners and composers to this day! 20. When and how did Beethoven die? We all like a tipple, but Beethoven may have been more partial to a pint than most. He was once arrested for being a tramp by an unsuspecting policeman who didn’t recognise him! After his death in 1827, his autopsy revealed a shrunken liver due to cirrhosis.